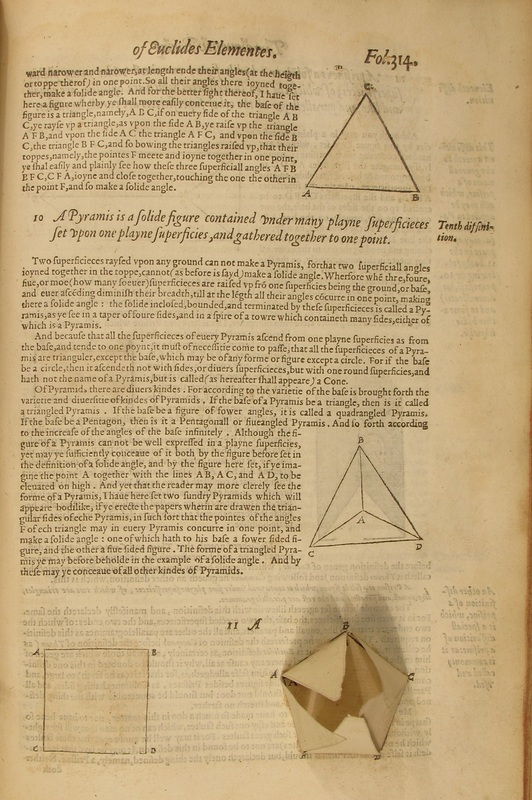 Euclid’s Elements of Geometry is the subject of the current exhibition in the Library’s Entrance Hall display cases, which runs until 27th June. 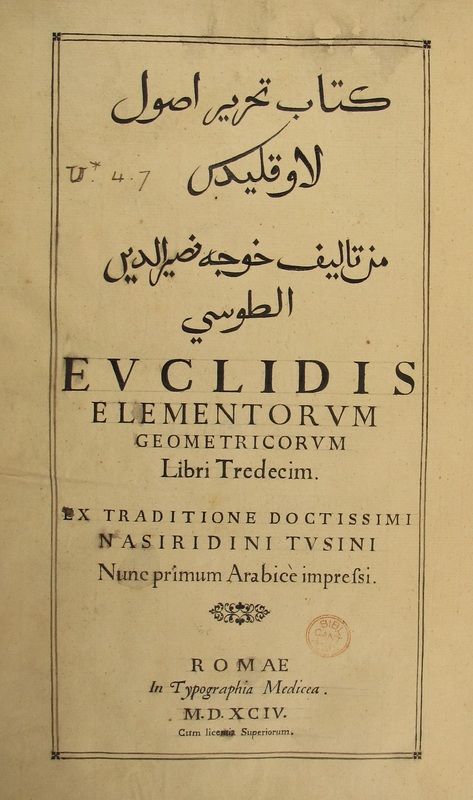 Written by Euclid of Alexandria around 300BCE and transmitted through the medieval world in languages including Greek, Arabic and Latin, Euclidean geometry has held sway in Europe for nearly two and a half thousand years; it has been used by surveyors to map fields and architects to design buildings, and studied by generations of schoolchildren. Early thinkers turned to it as a source of philosophy, whilst later readers saw in it a monument to the genius of the Greeks, or an exercise for improving the mind. Today Euclid is commemorated in place names, on postage stamps, and even as an interplanetary satellite. Nearly three hundred editions of the text appeared between 1482 and 1700, with a particular resurgence in the seventeenth century. Today, more than 1900 copies of these editions are extant in libraries and repositories across Britain and Ireland. This display of copies of Euclid’s Elements from the University Library’s collection includes several which arrived here in the seventeenth and eighteenth centuries, and it forms part of the Seeing Euclid network of exhibitions over the summer of 2018. Inspired by the research project Reading Euclid, based at the University of Oxford and funded by the AHRC, this exhibition is part of a collaboration between nearly thirty institutions across Britain and Ireland. 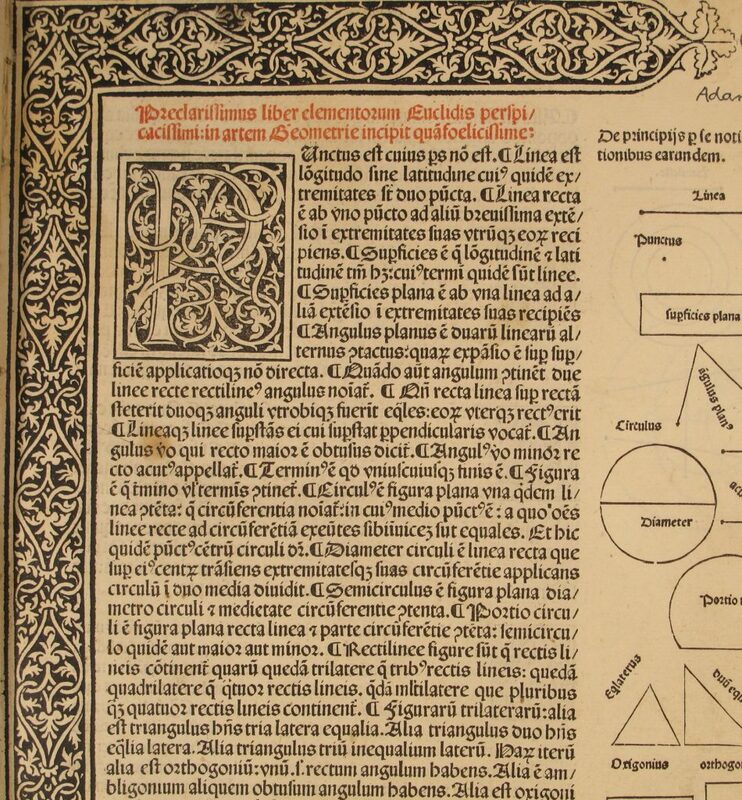 The Library is lucky to have two copies of the very first printed edition of Euclid’s Elements, produced in fifteenth-century Venice by Erhard Ratdolt and illustrated above to the left. Ratdolt was an early innovator in the printing of scientific diagrams and his edition contains the earliest known printed mathematical diagrams, which he crafted himself and which must have been time-consuming to make. His edition uses the thirteenth-century Latin text of Campanus, itself based on Arabic translations from the original Greek. This copy came to the Library in 1892 with the bequest of the astronomer John Couch Adams of St John’s College. Although Euclid’s work had survived the medieval period in Arabic translations, which would be re-translated during the Renaissance, the text was not printed in Arabic until the end of the sixteenth century, in Rome (see right). Produced at the Medici Press, established by Ferdinand de Medici and given a monopoly on ‘foreign printing’ by Pope Gregory XIII, it was based on a thirteenth-century version by the Persian mathematician Nasir al-Din al-Tusi. This copy, in Uppsala in the eighteenth century, was in Cambridge by the 1880s in the library of William Aldis Wright of Trinity College. Two important editions appeared in England in the sixteenth and seventeenth centuries. The first English translation, heavily influenced by the 1482 Venetian editions, was completed by Sir Henry Billingsley and published in 1570. The famous preface by John Dee states quite clearly that the translation was intended to help ‘common artificers’ and stresses the utilitarian aspect of geometry and the importance of experiment. Most interesting here are the pop-up diagrams. From the library of the Victorian astronomer John Couch Adams, this copy was bought in 1587 by the landowner Sir Thomas Tresham, at which time he was under house arrest for his Catholic faith. In the seventeenth century the great scientific minds of Cambridge made their impact upon the transmission of Euclid. These included Isaac Barrow, who excelled in Greek, Hebrew and Latin as a schoolboy and entered Trinity College in 1646, later becoming the first Lucasian Professor of Mathematics. Barrow’s simplified Latin version was published by the University in 1655 and was followed in 1660 by his English translation, which remained the standard version of the text in this country well into the eighteenth century. This free display, in the Library’s Entrance Hall cases, will be visible between 9.00am and 6pm Monday to Friday, and 9.00am-4.30pm on Saturday, until Wednesday 27th June. All are welcome.